1. 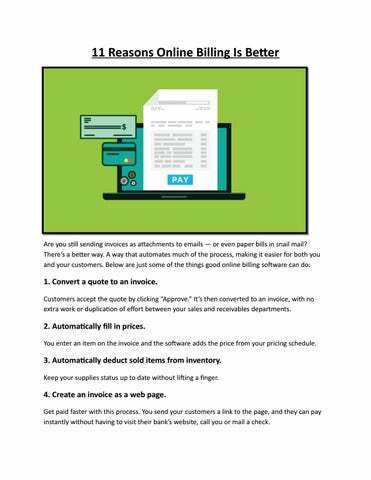 Convert a quote to an invoice. Customers accept the quote by clicking “Approve.” It’s then converted to an invoice, with no extra work or duplication of effort between your sales and receivables departments. 2. Automatically fill in prices. You enter an item on the invoice and the software adds the price from your pricing schedule. 3. Automatically deduct sold items from inventory. Keep your supplies status up to date without lifting a finger. 4. Create an invoice as a web page. Get paid faster with this process. You send your customers a link to the page, and they can pay instantly without having to visit their bank’s website, call you or mail a check. 5. Eliminate the need to send revised invoices. An online invoice also cuts down on error correction hassles. You can edit it right up to the moment your customer pays it. 6. Send an invoice from your mobile device. If your business takes you out and about, you can still send an invoice the minute a job is finished. 7. Accept credit cards and online payment options. Online billing software integrates easily with credit card, debit card, direct bank debit and online payment provider options such as Stripe, PayPal and GoCardless. 8. Automatically reconcile bill and payment. Link the billing software to your bank account and it will notify you when the bill has been paid, and when it’s overdue. 9. Automatically send past due reminders. You schedule the reminder for a specified number of days overdue and enter a pre-written letter. The software does the rest, tracking dates and sending the letters. 10. Reveal cash flow status. See your receivables picture at a glance: how much should be coming in next week or month. Compare that figure to your predicted expenses to get early warning of a possible cash shortfall. 11. Simplify tax preparation. Good online billing software can integrate with accounting software to automatically enter payments in your books and tax code them in real time. Result: no last-minute headaches at tax filing time. 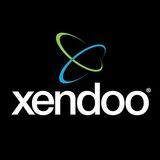 Xendoo’s services include Xero Accounting Sofware that can meet all of your invoicing needs. It’s technology at its best, reducing payment times, saving hours of manual data entry, taking your business mobile and more. Creating paper-based invoices can be time-consuming. Check out 11 reasons to go paperless and use online billing software.